This resort doesn't just have character, it has charisma. Soneva Jani is like someone with personal magnetism, someone who knows themself, knows the world and greets it with a big, welcoming smile. The perfect combination of luxury and nature, Soneva Jani offers guests an unparalleled experience in idyllic surroundings. Inspired by the word, which means wisdom in sanskrit, Soneva Jani is Medufaru island, which is part of an uninhabited cluster of five islands in the Nunu atoll. The most exclusive luxury hotel in Maldives and the most prestigious for many hotel brand in the world is surrounded by pristine beaches covered with lush tropical greenery and a turquoise lagoon with crystal clear water and unbeatable views of the 360 ? ?° Indian Ocean. 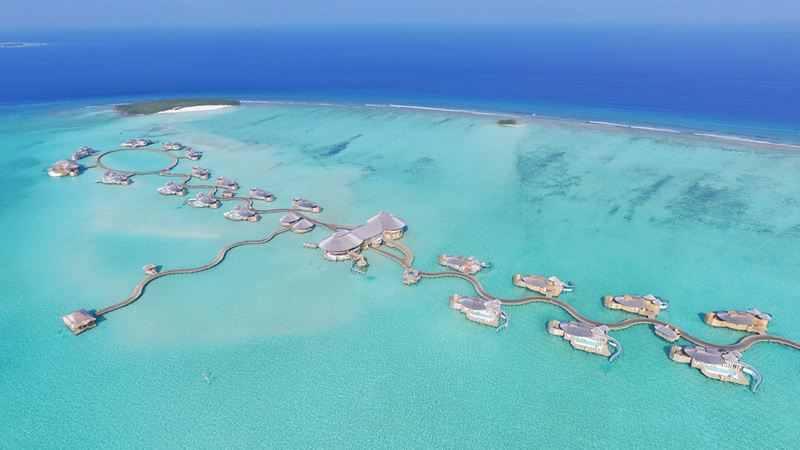 Today, Soneva Jani has 24 water villas and one beach villa, although at a later stage it is planned to build additional beach villas. 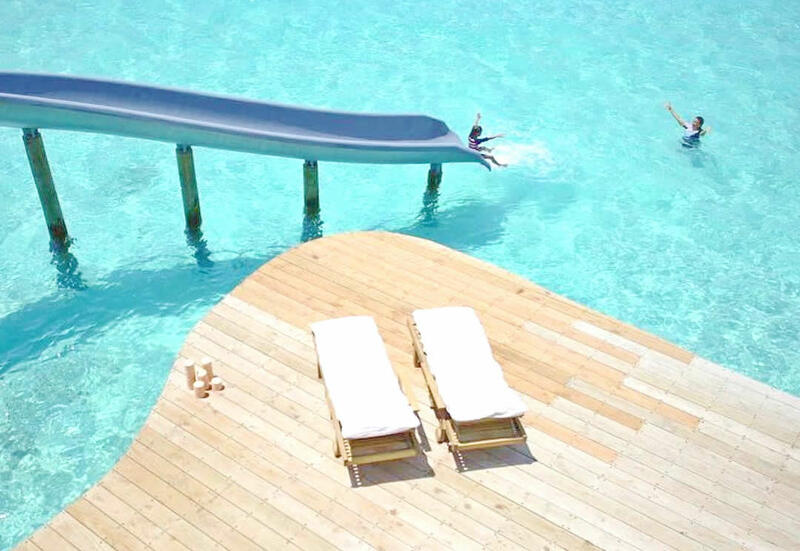 Each of the 24 water villas is superbly designed and has a private pool that looks out onto its own lagoon site, and some villas are equipped with water slides from the sun deck down to the lagoon. Feature of the villas is a retractable roof in the main bedroom, which is retracted at the touch of a button so guests can lie in bed and count the stars. 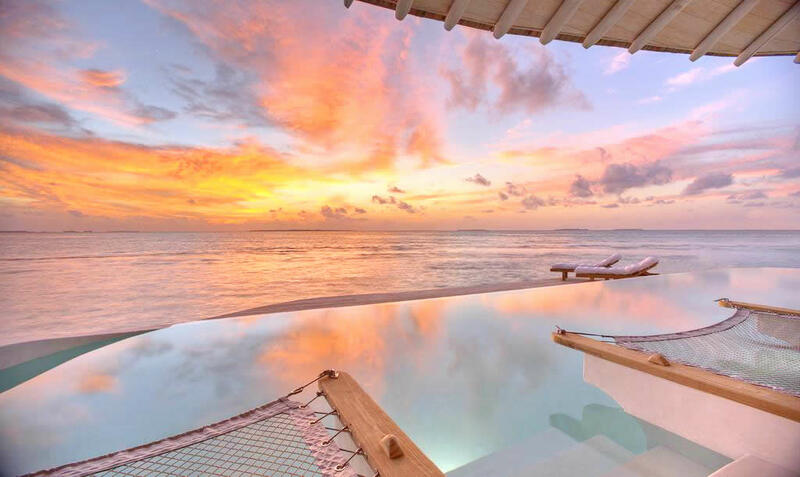 Soneva Jani features in our list of the top 10 best new Maldives hotels, and the most stunning water villas in the Maldives. Soneva Jani is set on Medhufaru, one of the largest islands in the Maldives. Medhufaru is part of the Noonu Atoll and is surrounded by the Edufaaru lagoon. 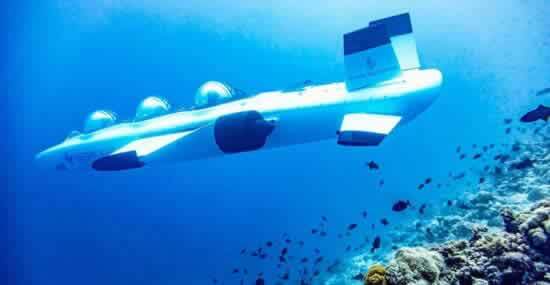 From Male it is a 40-minute scenic seaplane flight to Medhufaru island. 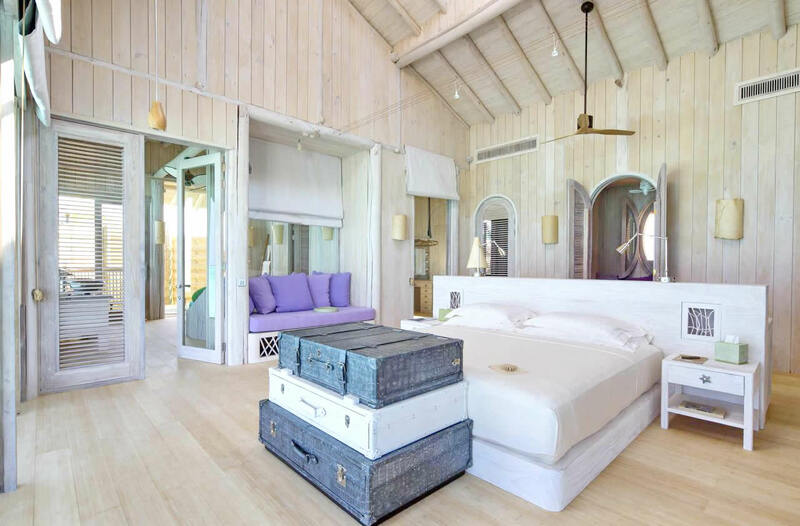 Alternatively Soneva Jani can be reached via Soneva Fushi, which takes one hour by speedboat transfer. Guests also have the option of cruising between the two resorts on Soneva in Aqua, the resorts' luxury private yacht. After receiving the baggage at Velana (Male) International Airport, you are met by Soneva staff and escorted to a specialized Soneva lounge near the seaplane terminal where you can wait for your final transfer by seaplane to the hotel. In the lounge with eco-chic design Soneva and even a small spa guests are offered a refreshing drink and some snacks, and the owner of Soneva takes care of check-in (so that everything would be ready for your arrival on the island). Getting to the resort is half the fun, as a 40-minute seaplane transfer in Soneva Jani is an exciting excursion in itself. The seaplane flies quite low over the Indian Ocean, offering an amazing view of the tiny, sugar-white island rings sparkling on turquoise colored lagoons and a shiny blue sapphire. Flight by seaplane in the Maldives and admiration for an ideal archipelago from a bird's eye view is one of the most impressive events that this tourist destination can offer. Passenger air transportation on seaplanes is very well organized, as Soneva has a privileged relationship with Trans Maldivian Airways, operator of seaplanes; This means that the waiting time in the Soneva lounge on the day of your arrival in Maldives or departure home rarely exceeds two hours. One of the many attractions of the resort is its location in a large 5.6 km lagoon with crystal clear waters with continuous panoramic views of the Indian Ocean. The lagoon is so huge that it can accommodate more than 7,000 olympic pools. It is impossible to find words for describing this hypnotic picture, where 50 shades of blue amaze the entire Maldivian archipelago and are present on the shallows of all the islands of the atoll, but nowhere are they as blue and clear as around Soneva Jani. In fact, these are the brightest shades of turquoise and the most amazing lagoon that you have ever seen in all your years of travel around the world. The unique feature of Soneva Jani that distinguishes it from other resorts in the Maldives is lagoon has access to at least five islets (four of them are deserted). The main Medhufaru island is one of the largest in the Maldives, bordered by pristine beaches and covered with lush tropical vegetation. For 10 years he served as a farmhouse before Soneva Jani was conceptualized, and extensive gardens on the island still supply fruit, vegetables, herbs and mushrooms to the resort's kitchen, and to the sister Soneva Fushi. Here in the garden, guests can wander through the 'Labyrinth', a meditative network of paths created from the hedge of the ficus, which follow an ancient circular pattern. As for the other four islands in the lagoon, a beach club with a covered restaurant offering seafood dinners is located on Zuhairs Island, and the remaining three remain completely undeveloped, so there is always a place where you can play in the Robinsons. During the construction of the resort, the management of Soneva Jani continued to have minimal impact on the environment. Pools use sea water with UV filtration, and villas are built above the sandy floors of the lagoon without affecting any part of the reef. In addition, solar PV is an important source of energy in the resort, all wastewater is collected and processed on site, and water is also produced on site, including drinking water. Soneva Eco Centro Waste-to-Wealth Center guarantees that the waste is recycled, and the extensive vegetable garden offers local products for restaurants based on organic principles. 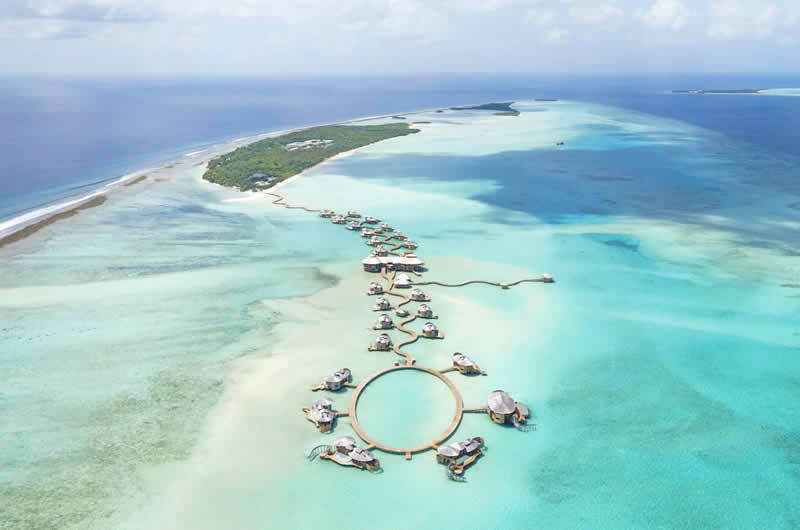 Soneva Jani is comprised of Water Retreats, Water Reserves and Island Reserves. In this vast space with islands and a beautiful lagoon there are only 24 villas above the water and one Bedroom Island Reserve (with additional beaches planned at a later stage). Of course - this is one of the densest resorts in the world. The scale of each villa is extraordinary, with one bedroom (catering for couples and families with young children) and villas with several bedrooms (catering for large tourist groups). Surrounding villas are located along the 1.7-kilometer (1 mile) pier, which is connected to the island of Medhufar and hovers over blue water, wriggling like a snake. At more than 410 square meters, one-bedroom villas are the largest type of luxury accommodation in the Indian Ocean. Each water villa has its own pool (which is large enough to host a championship) which offers a stunning view of its own lagoon site, and some villas are equipped with curved water slides that run straight from the upper deck down to the lagoon. Even if you stay in the lowest category of the resort accommodation - One-bedroom Water Retreat - it will be much larger than the presidential apartments of the very best 5-star hotels. Spread over two floors, the villa features its own private 13m pool on the terrace, surrounded by extensive sunbathing areas, overlooking the ocean and ideal for admiring the sunset (villas on the other side of the pier are facing west). In addition to the spacious master bedroom and sleeping area for children, you will find inside a small kitchenette with a refrigerator, an office, a dressing room and a living room with armchairs, ideal for relaxing. The sleeping area for children is conveniently located in the main bedroom (so parents can be sure that their children are always near). Magnificent bathroom under the open sky, located next to the main bedroom, is distinguished by a secluded wooden space with ample space for swimming. Three different glass windows in the floor in the villa ensure a permanent visual contact with the marine life below. Upstairs there is a living room and dining room with a roof. 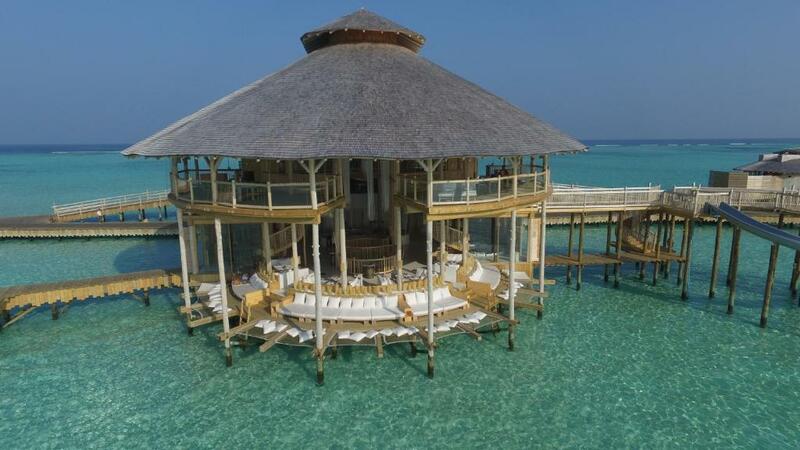 Accommodation makes money, and food and drinks make a reputation, and Soneva Jani here can not fail to impress, as the menu is as extravagant as the resort itself. All of the highest quality and presented with full attention to detail: from the freshest tuna and thin pizzas, to piquant Indian curry, shish kebab from mutton and delicious salads. In total, there are five restaurants offering a variety of cuisines and experiences in which the chefs of the resort deceive your tastes and mind with thoughtful masks. The main restaurant, called So Fresh, is located in 'Gathering' and offers sumptuous food for breakfast, lunch and dinner. So Fresh has a lot of corners, verandas, terraces and other rooms to choose from to take your dining table, so every meal can be done in a completely new setting, if you want. But Soneva Jani also has an exquisite tasting room (So Imaginative), a secret dining place (So Engaging), an intimate restaurant in the Observatory (with four tables equipped with screens connected with the view from the telescope), a restaurant under the awning with a menu of fresh seafood on the island Zuhairs, and a restaurant in Cinema Paradiso. In January 2019 Soneva Jani has unveiled the latest addition to its culinary offerings, the Crab Shack. The 32 cover restaurant and 14 seat bar is located on Soneva Jani’s southwest beach, on the opposite side of the island to Cinema Paradiso, and is comprised of two levels. The Crab Shack is open for lunch and dinner with an á la carte menu. Upstairs serves only drinks and light snacks. While no local crabs will be on the menu, Sri Lankan mud crabs, Alaskan crabs and Kamchatka crabs (all Marine Stewardship Council certified) are the highlights. Each day the Crab Shack will only serve one type of crab on a rotating basis. The dishes that can be ordered include chili crab, crab curry (both Thai and Sri Lankan varieties of curry), garlic crab, black pepper crab, Szechuan spicy wok-fried crab, Vietnamese wok-fried crab with tamarind, ginger and black pepper. The menu is also supplemented with Mediterranean dishes, including marinated sardines, mussels meunière, crab and seafood bouillabaisse (subject to availability), spicy seafood salad, and a ceviche of the day. There will also be a seafood platter that includes soft shell crabs, calamari, scallops and more. This platter can be ordered cold or warm (steamed, wok-fried or barbecued). A number of vegetable based side dishes will also be available, using organic greens from the resort’s gardens. Dishes include broccoli with caramelised garlic and marinated artichokes. When it comes to drinks there will be a focus on rosé and Sauvignon Blanc, while there will also be a selection of red wine. Soneva has gained a worldwide reputation for its collection of wines and sommeliers, and in Soneva Jani wine can be found in a glass tower 6 meters high, and the list contains about 50% organic and biodynamic wine. The resort has its own chocolate and ice cream shop, which is open from noon until late at night and is free for all guests. You can choose more than sixty ever-changing tastes of home-made ice cream and sorbets in the ice cream hall. You can also pamper yourself with each child's dream of endless chocolate, trying chocolate truffles from cardamom, and constantly changing the abundance of confectionery. Children of all ages are more than welcome at Soneva Jani, where each master bedroom has an adjacent kids sleeping area. The Den is the fantastic children's playground, where toys and dressing up clothes are provided, and various activities are on offer, such as snorkelling and protecting turtles. The resort has the largest overwater structure in the Maldives, the so-called 'Gathering', which looks like something of a fairy tale. Three stories high and located halfway to the pier, 'Gathering' is the heart of the resort. There are various restaurants (more details about it below), as well as a spa, a gym, a library, a boutique store, a chocolate bar + ice cream parlor, a wine cellar and a children's club. The Gathering has a soaring atrium from the open side, with a labyrinth of stairs and paths that connect all the floors, rooms, inside and out. The structure is assembled from 104,000 parts of Red River Gum Shield wood from Laos. In addition, there is a large water slide along which guests can flop into the ocean directly from the terrace of the second floor. The Soleni diving school and the Champa Marine Biology Center are located next to The Gathering. There are rumors that the spa may eventually move to another place, and here is planned a much larger, children's club. The resort features the first silent cinema in the Maldives - the so-called Cinema Paradiso - on the southern tip of the main Medufaru island. Here you can relax on comfortable sun loungers under the stars and have a snack with fresh popcorn, while at the same time watching what's happening on the screen with Bluetooth headphones, leaving surrounding nesting turtles and wildlife in peace. Twice a week there is a selection of films for children and adults, with an emphasis on classic and inspirational films. For an additional fee, movies and snacks can be arranged privately. Guests of Soneva Jani can explore the night sky from the first overwater observatory in the Maldives. 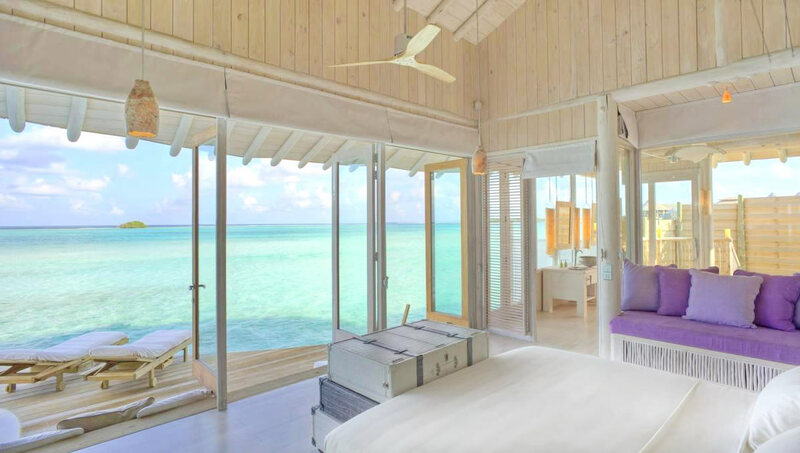 This popular experience impressed guests of all ages in the sister hotels of Soneva: Soneva Fushi and Soneva Kiri, and the designers made the observatory in Soneva Jani even better. A modern telescope rises through the floor of the observatory, offering unique views of the starry sky. The place is surrounded by four dining tables, beyond which you can dine if you want. The tables themselves are equipped with screens connected with the view from the telescope, allowing you to chew and view the stars without lifting their heads. Soneva Jani has plenty to offer in terms of activities and experiences. Join in on nature walks or cycling around the islands, or enjoy an array of water sports. The Soleni Dive Centre provides fantastic diving in small groups, so guests can benefit from the instructors and their knowledge of the local marine life. Alternatively, relax at Cinema Paradiso, a comfortable over-water 'silent cinema' where the audio is played through individual headphones for each guest. Guests may also visit the hotel's garden - the island was previously a farm and the gardens still remain to supply fruit and vegetable for the kitchen! For a truly ‘out of this world’ experience, Soneva Jani is inviting aspiring astronomers to try out its observatory, the first overwater observatory in the Maldives. The recently opened Soneva Jani boasts a sophisticated telescope that rises through the floor of the observatory deck, offering guests enchanting views of the starry sky above. Guests can listen to Soneva Jani’s resident astronomer, on hand at the observatory deck to offer an introduction to astronomy, whilst more seasoned star-gazers can opt for a private astronomy lesson to learn the intricacies of the night sky. Those seeking a truly rare experience can arrange an exclusive dining experience in the company of the stars at So Starstruck, where screens linked to the telescope allow guests to enjoy the celestial view whilst sampling Soneva’s exquisite cuisine. Soneva Spa offers a wide range of traditional treatments, as well as a gym, yoga pavilion, sauna and steam room. Sleep under the stars from the comfort of the master bedroom as the roof fully retracts. There is also a rain sensor so should it rain in the night it will close automatically! Although it is incredibly beautiful, the lagoon does not abound with fish (yet), although the fish will necessarily return when the water construction of the resort is fully completed. The good news is that the resort is surrounded by a 12-kilometer (7.5 miles) stunning house reef that surrounds the lagoon and can be reached by boat (unless you are a very good swimmer). It includes corals of all kinds and large schools of fish, as well as huge old coral colonies creating a beautiful shallow three-dimensional reef. On snorkeling you can also be lucky enough to see beautiful sea turtles and manta rays, that are native to this area of ? ?the Maldives. There are also many dive sites with a rich marine life around the resort, which are sure to attract all the fans of scuba diving. With a price corresponding to the experience, Soneva Jani is one of the most expensive resort hotels in the world, although it is difficult to argue that it does not offer a good value for money. This is the perfect exclusive holiday and the most divine hotel in the world. In 2018 Soneva Jani has become the latest Member of the International Pole & Line Foundation (IPNLF), the non-profit association that is committed to developing and supporting responsible one-by-one tuna fisheries and supply chains.